Justin Fletcher is heading back to Sunderland Empire in 2018! 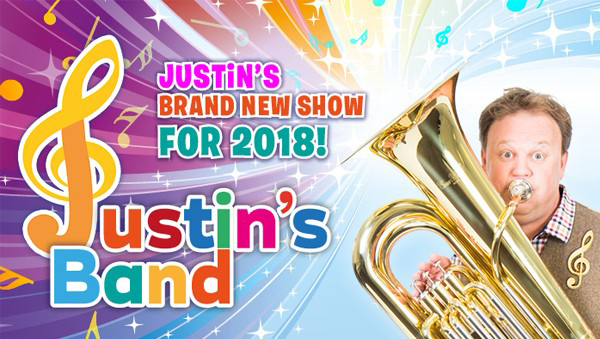 BAFTA award-winning actor Justin Fletcher is coming back to Sunderland Empire with his brand new show – Justin’s Band for one performance only on Sunday 8 April 2018 (11am) following two sell-out shows earlier this year! Join Justin and his friends on a musical adventure singing lots of songs and learning about musical instruments along the way. There will be bags of fun and laughter and lots of live music from Justin’s Band. So make a musical note in your diary and we will see you there! Tickets on public sale: 10am, Thursday 30 November. *Calls cost up to 7p per minute plus your standard network charge. Booking fees may apply to telephone and online bookings.